GPS satellites are just fast moving clocks, spewing out time code as they hurtle through space. 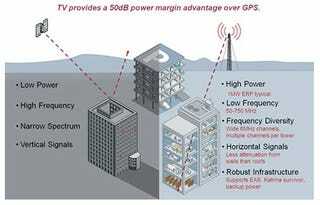 Digital TV towers also spew time code, and could be a terrestrial GPS system or GPS assistant, says Ars. There's a company called Rosum who has been working on this technology for a while, and is finally getting some headway. Their goal is to help devices that spend all or most of the time indoors enjoy the benefits of global positioning. They're currently focused on integrating their TV-assisted geo-location into femtocells—without a GPS lock, these internet-connected cellular repeaters are useless, even though they're totally meant for use indoors. By locking onto the timecode embedded in TV signals from known locations, they can get a fix. As you probably know, wi-fi networks mapped by Skyhook use this same basic concept. Rosum likes TV signal because it's especially strong, it penetrates walls, and "it's roughly 12,000 miles closer" than GPS.